Before you attend your first cycling class, feel prepared by understanding just what you’re getting into. When you follow these tips, you can go to your first cycling class acting like a professional. 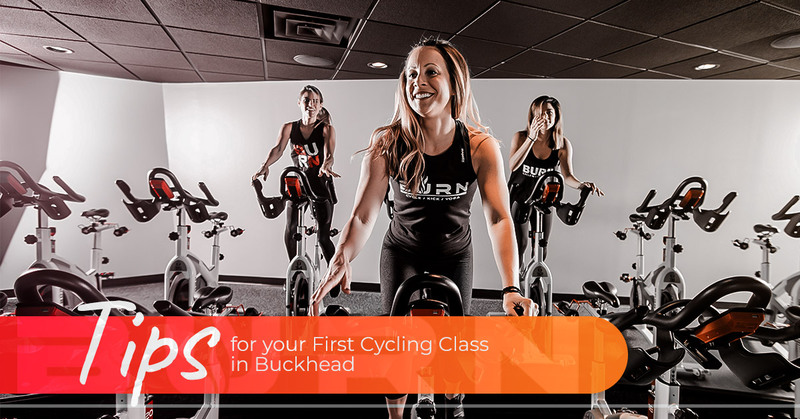 Take a cycling class at Burn Studios in Buckhead and Brookhaven to experience the spin craze for yourself. When you sign up now, get five classes for just $55! Whether you’re new to cycling classes or have been cycling for a while, wearing proper clothes is very important. Since you’ll be sitting on a bike seat, you might want to invest in a pair of cycling shoes and padded shorts. Unlike normal sneakers, cycling shoes clip onto your pedals so your feet won’t slide while you pedal. This gives you more strength per revolution and provides your feet with solid support so you’re not flexing them for the entire cycling class. Since pedaling is a repetitive motion, padded shorts help reduce chafing and pressure points while your cycle. Choosing the right clothing option will help reduce discomfort both during and after your class. A cycling class is challenging, especially if it’s your first time. There is no shame in taking a break for a minute or two if you need it! Just make sure you stop safely since you’ve been cycling for a long period of time. Lowering the resistance first and slowing down your pedaling is safer than coming to a complete halt in the middle of your class. Cycling classes use high-energy music to help you get into the workout. Enjoy it! Listening to loud and upbeat music will help motivate you and your class to up the ante and help you give the most effort. Pay attention to the type of music different instructors play and find the right music to help maximize your workout experience! During your first cycling class, you’ll hear a lot of new terms. Familiarize yourself with these most popular spin terms and you’ll look like a pro on your first day. “Pedal Stroke” – This is when you move the pedals in a circle. For proper cycling, you want to make sure your pedal strokes are smooth the entire class. If they’re not, lower your resistance. “Intervals” – These are the segments of the class. One interval might be 20 seconds with 10 seconds to rest. Intervals are usually performed at maximum effort for a short period of time. Follow your instructor’s guidance to get through these intervals. “Let’s Stand” – Stand up on your bike by shifting your weight forward, lifting your glutes and hovering your weight over the pedals. This is challenging, so sit back when you need a break! Once you know the basics of a cycling class, your first session will be less intimidating. Get ready to spin and maximize your workout. While you’re at it, try a cycling class at Burn Studios in Buckhead and Brookhaven, and choose from our Burn Cycle or 30/30 classes.